More pickles than ever are being eaten each day, including new and innovative varieties – from long, thin, flat cuts for stacking on sandwiches, to fiery Cajun-flavor ones for snacking. Practically every crunchy vegetable is now being pickled in several degrees of heat, sweet and sour. Archeologists and anthropologists believe that pickling began in ancient Mesopotamia around 2400 BC. As early as 1400, the English word pikel meant "a spicy sauce or gravy served with meat or fowl". The middle Dutch word pekel referred to “a solution for preserving and flavoring food”. In the modern English language, it was expanded to include brining for preservation, and also referring to the resulting products. Believed to provide physical and spiritual strength, pickles were fed to the armies of Julius Caesar and Napoleon. Apparently, Cleopatra also ate large amounts of pickles to preserve her beauty. Pickling isn't only about procedure, it is about tradition and community. Different cultures throughout the world pickled to preserve fruits, vegetables, meat, and fish. During good harvest seasons and bad, pickling assured safety and extended the freshness of food. Whether pickles are sold from a pushcart or bought in a supermarket, the simple reason for their longlasting popularity is because they taste good. Genuine Dills are "processed" by adding dill weed to the barrels during the last stage of fermentation. Their flavor is more concentrated and sour than other dill pickles. Kosher Dills are made the same way as regular dills, but plenty of garlic is added to the brine towards the end. "Kosher dills" are not necessarily produced according to Kosher laws, but refers to a flavor profile. Overnight Dills are fresh cucumbers that are brined in the refrigerator for only a few days. Bright green and crunchy, they taste fresher and less acidic. Sour/Half Sour Pickles – These crispy and green pickles are refrigerated throughout the entire process. 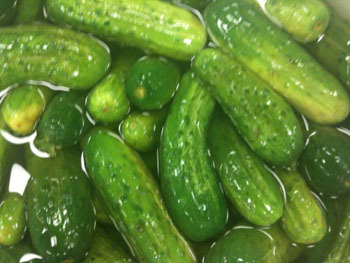 Fresh cucumbers are placed in a non-vinegar brine; the longer they remain in that brine, the more sour they become. Bread and Butter: Circle-cut cucumbers, onions, and chopped peppers cured in a sweet, tangy brine. Candied: Pickles cured in a sweet syrupy brine. Gherkins: Miniature dill or sweet pickles.